the final installment of The Commonline Journal. The cover of this issue is a lithograph created in 1935 by Mexican artist José Clemente Orozco called "The Masses." Orozco, who lived in the United States during the 20's and 30's, frequently used caricature and satire when envisioning political subjects. As a cover, the piece is an excellent representation of the strengths and tragic vicissitudes of the masses acting in common. It shows a fractal sea of blended and overlapping individuals waving flags with their mouths wide open. The unflattering image illustrates a relationship of tension between the power of collective determination and individual authority (self-determination / responsibility). 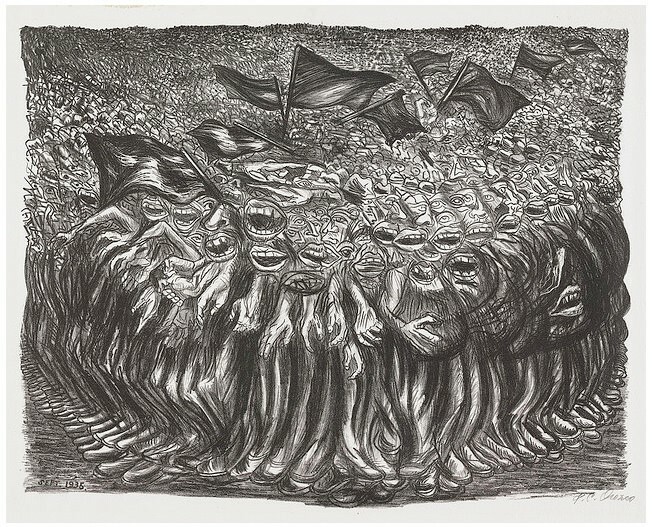 More radical than politics the lithograph alludes to the axis issues common in existential metaphysics, questioning the concepts of form, mind, identity, self, freedom, truth and reality. 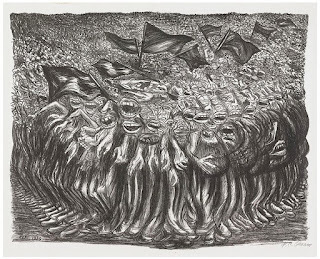 Like Orozco's "The Masses," The Commonline Journal is comprised of exuberant and often brutal critiques of the self, its conditions and surroundings. A homage and mode of literary realism, adherence to a common line means writing honestly about life in forthright language. It means creating an incisive record of experience remarkable in content, pattern and precision— disclosing suffering, pleasure and paradox to the reader. Enjoy the last issue of The Commonline Journal.